It’s that time of the year again, where we singles sit on our couches and watch rom-coms on repeat. But why spend money on Insomnia or GoPuff when you have an entire kitchen full of ingredients to make your own recipes? Instead of trying to shower someone else with your love, spend the day treating yourself with some comfort food. As they say, the most important person to love is yourself. Coat the pan in butter, then pour in the batter. Tell me you don’t want to make a single-serving cake in a skillet. You’ll find us on the couch with these in our laps (on top of a towel for the heat, of course). Not only is it dramatic to eat, you’ll be so proud of your culinary prowess that you won’t feel one bit guilty. Recipe video here. Can’t decide between candy or chocolate? This recipe is a perfect compromise. You can also use up those candy hearts your friend who has 5 Valentines didn’t want. Like popcorn, you can munch on this all night. Forget about a night on the town; Oreos and cheesecake are always more comforting than a full course meal. Just don’t be ashamed to tell your roommates you aren’t sharing. These are for you. Bring out your creative side with a classic childhood treat. It will remind you of a simpler time when cooties existed and the entire class got Valentines Day cards. A-la-Mode means: to be served with ice cream. We’re down with that. 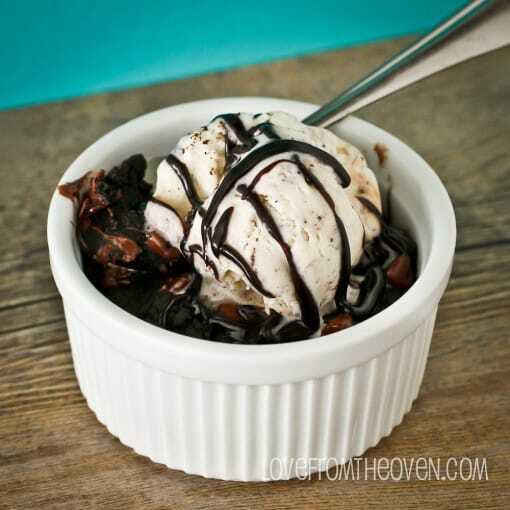 Brownies and ice cream is always a better combination than roses and chocolates. But don’t follow the picture above. We’re giving you permission to use the whole pint.